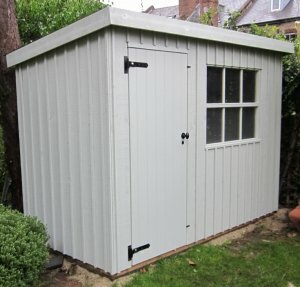 Pent Roof Sheds | Pent Sheds | Delivery & Installation Incl. - Handmade to order in our Norfolk workshop. 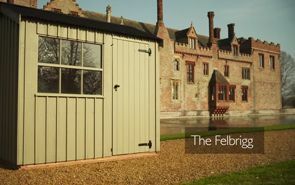 - Choice of 6 colours from our National Trust range. - Delivered and installed in your garden. 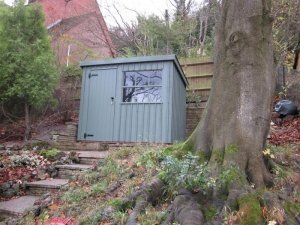 - Under 2.5m high to meet modern planning requirements. - Traditionally styled windows with toughened glass. - Cast iron black door furniture with a mortice lock. - Olden style black corrugated roofing over a pine tongue and groove ceiling. - Crafted from FSC® certified Scandinavian redwood. - Traditionally cladded using vertical sawn boards. - Available in 3 different sizes. - For each product sold a contribution is made to the National Trust to help look after and conserve special places for ever, for everyone. Inspired by nature and taken from the National Trust paint range, our colour range gives long lasting protection for exterior timber. This colour chart is designed to provide an indication of the colours in our palette. It cannot be taken as an exact replication of colour. However, we are happy to send out colour samples. ex 12 x 150mm sawn cladding topped with ex 14 x 30mm sawn cladding on 38 x 50mm planed framing. For the summerhouses one pair of joinery made, double doors 1830mm wide x 1100mm. 3/4 glazed with 4mm toughened safety glass and cross leaded. Fitted with a mortice lock and finished with black Fleur-de-Leys hinges and door handles. For the sheds a 710 x 1800mm joinery made, ledged and braced door, hung with the use of black strap hinges and secured with a mortice lock and black handle. For the summerhouses, 4 cross leaded, 4mm toughened safety glass windows set into a joinery made frame. 2 of the windows opening and furnished with black Fleur-de-Leys casement stays and window fasteners. 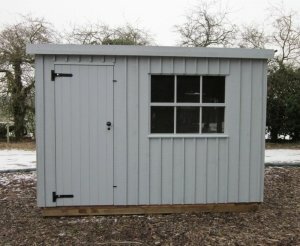 For the sheds, fixed Georgian windows fitted with 4mm toughened safety glass set into a joinery made frame. ex 19 x 125mm tongue and groove floorboards on ex 38 x 50mm tanalised planed floor joists set at no more than 450mm centres. ex 19 x 125mm tongue and groove roof boarding on an ex 38 x 50mm frame covered with corrugated roof sheeting. All buildings are under 2.5m to the ridge, to meet planning requirements, and have an internal eave height of 1.9m on the Blickling, Peckover, Felbrigg, Orford, Lavenham and Ickworth. And 1.8m on the Oxburgh and Flatford. Painted with a coat of microporous paint, please choose your colour from our National Trust palette. Crane Garden Buildings accepts the following payment options for online transactions. 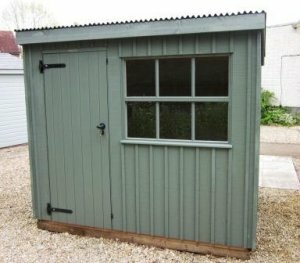 Designed and hand-built at our factory in Norfolk, this Oxburgh Shed from our National Trust range was selected by a customer as a traditional addition to their beloved garden. 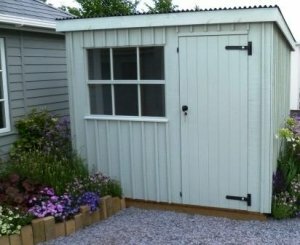 The shed measures 6 x 8ft and is an attractive Garden Shed with rustic features. Alike all of our FSC® certified Scandinavian Redwood timber buildings, the shed was delivered and assembled at the customer’s address by our expert in-house installations team. Selected from our range of FSC® certified timber buildings inspired by the National Trust, this attractive Oxburgh Garden Shed was recently installed for a customer based in Lydney, Gloucestershire. 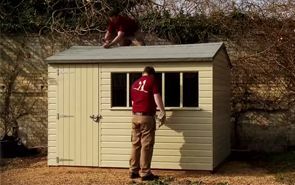 Measuring 1.8 x 2.4m, the shed was both delivered and installed by our team of expert, in-house fitters who ensured everything was perfect before leaving the premises.